As fall settles in with cold winds and frosty mornings, I crave baked goods like these fragrant and buttery Peach Cardamom Scones. 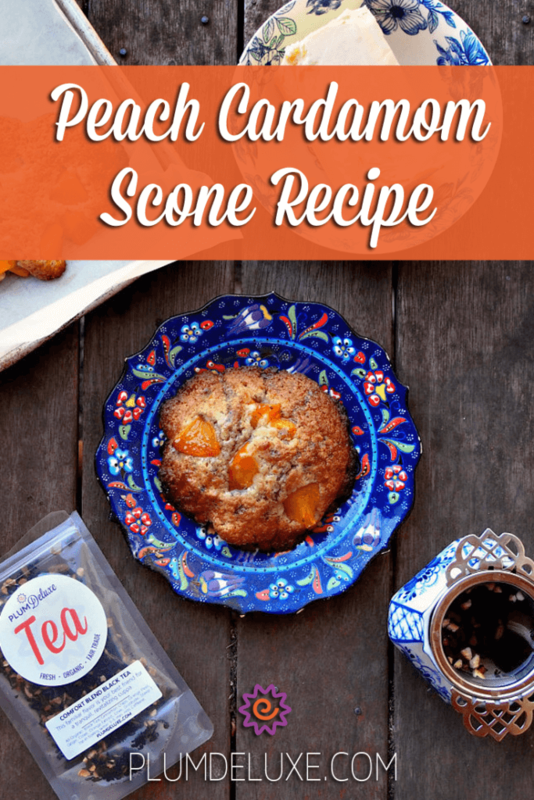 Tender, fragrant dough filled with juicy peach pieces, these Peach Cardamom Scones will fill your mouth with a burst of flavor in every bite. These delightful scones made from cardamom and maple-infused dough are lovely served warm or cold. My husband loves them for his morning tea, spreading them with a generous layer of salted butter before sighing in happy bliss with each bite. 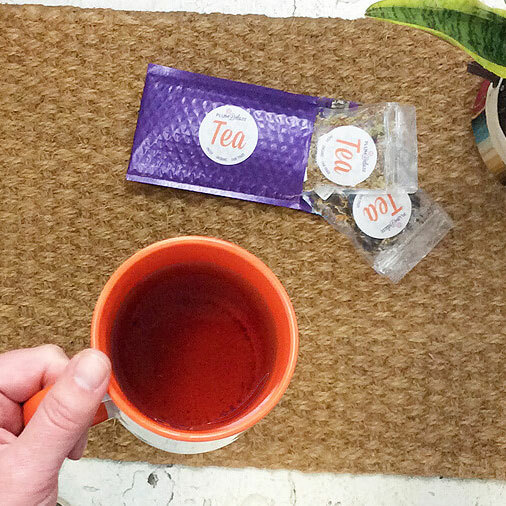 We love scones around here. 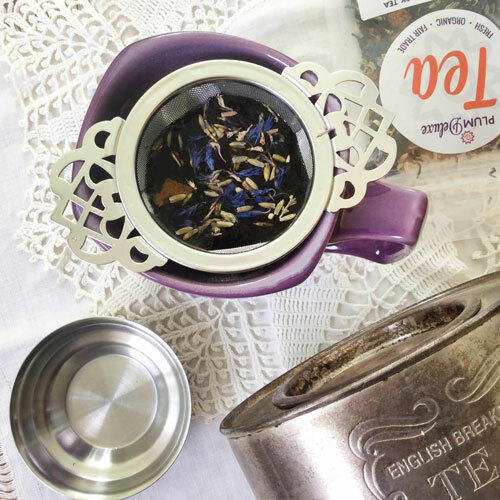 From our savory Sweet Potato Scones and Cheese Scone Recipe to Gluten Free Raspberry Scones and Dark Chocolate Cranberry Scones, we always have the perfect pairing for a cup of tea. 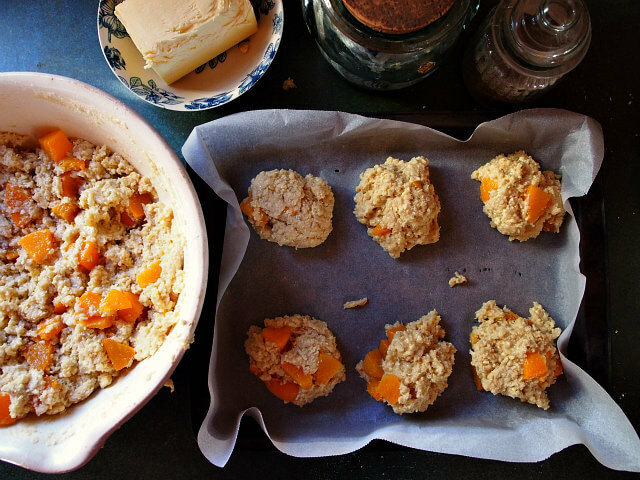 These Peach cardamom scones are a unique cross between traditional scones and our lovely scone cookies, tender and flaky like scones but with the slightly chewy texture and crunchy edges of scone cookies. The honey cardamom glaze on top makes them sweet enough that there is no need for additional jam or sweetened cream — but no judgement if you want to add a little something extra! While these scones would be lovely with a plain dough, they are at their best with cardamom as well as both vanilla and maple extract. While baking, your home will fill with a divine aroma. The buttermilk gives them a nice tang that pairs well with the sweet peaches. 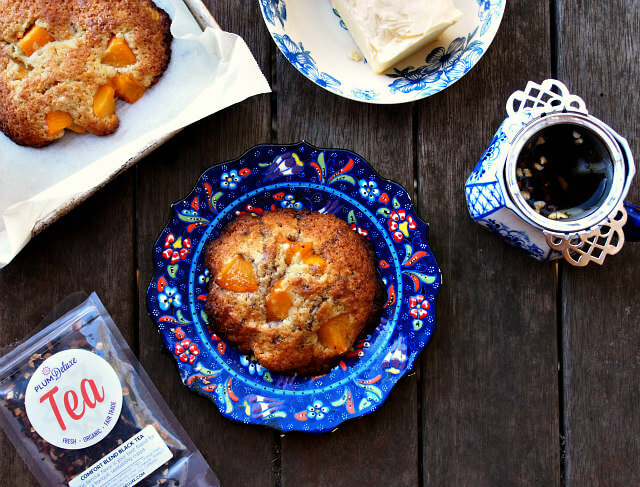 Fresh peaches taste wonderful in these peach cardamom scones. Be sure to peel them beforehand to allow the peach pieces to release their juices into the scones while baking. You can also use canned peaches in this recipe, but be sure to drain them well or the extra juice will make the batter quite wet and may result in a scone that spreads out rather than up. Such a rich, buttery dough benefits from a sweet, light glaze. You can make a sugar-based glaze, but I like to use honey for this recipe. Honey pairs so beautifully with fresh peaches and enhances the spices. Simply warm the honey gently before stirring in a generous spoonful of ground cardamom. The warmth of the honey will not only make mixing easier, but it will also draw out the cardamom flavor and fragrance. While we like these peach cardamom scones with plenty of salted butter, they are also nice with a dollop of whipped cream, only lightly sweetened. They can be turned into a dessert with a side of ice cream like a maple nut, rum raisin, or good old vanilla. If you fancy an extra bit of sweetness with your scones, these ones go well with warming toppings like ginger peach jam and spiced apple butter, or a spoonful of creamed honey. 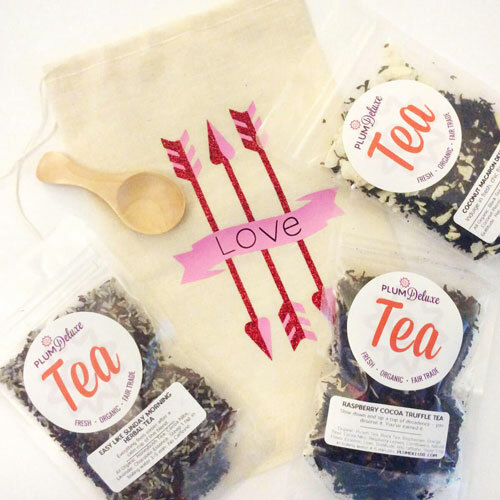 I like to serve them with hot, spiced teas such as Comfort Blend Black Tea, Vanilla Latte Tea with cardamom and vanilla, and Rainy Day Puerh, sweet and spicy with cinnamon, ginger, and anise. 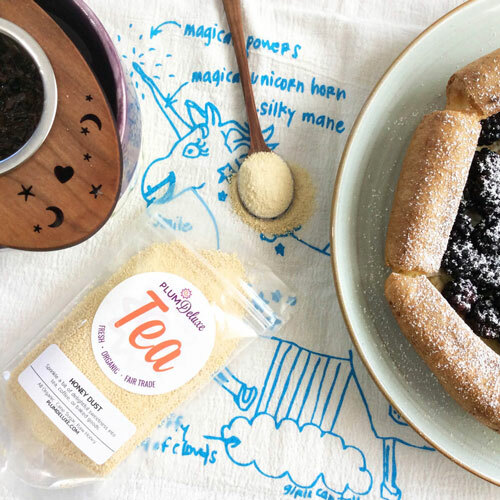 Thanks to the lavish amount of peaches in these scones, they also pair nicely with herbal teas like Evening in the Garden with elderflower, rose, and lemon; Hello Sunshine with turmeric and maple; or Peace blend with lemongrass, ginger, and jasmine. 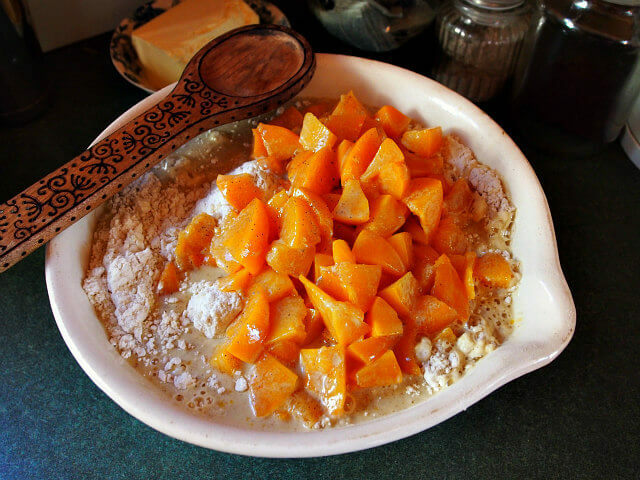 In the bowl of food processor, add flour, cardamom, baking powder, baking soda, salt, and sugar, and pulse to mix. Add butter and pulse until mixture looks like coarse breadcrumbs. Dump mixture into large bowl. In a small bowl, whisk together eggs, buttermilk, vanilla, and maple. 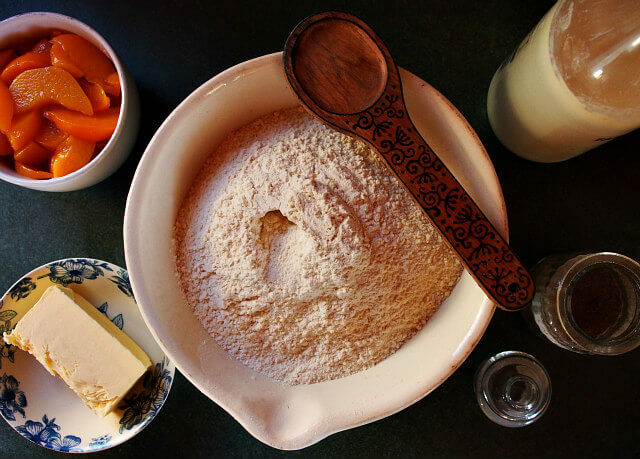 Add to dry ingredients and stir gently with a wooden spoon just until flour disappears. Add peach pieces and stir gently just until mixed. Cover baking sheet with baking paper. Use 1/2 cup measure and scoop dough onto baking sheet 2 inches apart. Bake 20-25 minutes until tops of scones are golden brown. While the scones are baking, gently warm honey in a small saucepan. Stir in ground cardamom and remove from heat. When scones are baked, cool 5-10 minutes, then drizzle with honey cardamom glaze and serve warm.